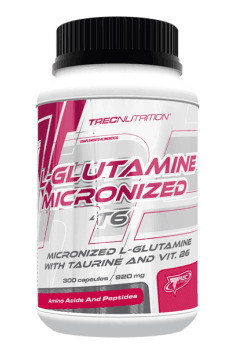 Trec L-Glutamine T6 is a dietary supplement in capsules containing L-glutamine and the addition of taurine and vitamin B6. The product is an excellent nutritional support for physically active people and contributes to the proper functioning of the immune system. Glutamine is the most abundant amino acid in human blood, skeletal muscle and in the free pool of amino acids. It plays an important role in various metabolic processes, as an intermediary in energy metabolism and as a substrate for the synthesis of peptides, proteins, nucleobases, glutathione and neurotransmitters. In addition, glutamine contributes to the maintenance of acid-base balance, because its production requires the toxic ammonia circulating in the body, resulting from the transformation of other amino acids. Despite the fact that glutamine can be produced in the body, in catabolic states such as, for example, trauma or sepsis, its levels in the body are significantly reduced and it was considered a conditionally essential amino acid. Higher valuation of glutamine is also based on the observation of cells undergoing frequent divisions, including mainly enterocytes and lymphocytes. These cells use large amounts of glutamine, often exceeding its endogenous production. Based on the uncritical assessment of the available scientific literature and declarations of manufacturers and users of dietary supplements, glutamine provides an excellent nutritional support for physically active people and contributes to the proper functioning of the immune system. The most frequently mentioned benefits of glutamine supplementation include: improvement of the functionig of intestinal barrier and reduction of the risk of endotoxemia and infection, stimulation of muscle glycogen synthesis and muscle protein synthesis, increase of muscle tissue, reduction of muscle pain, improved muscle tissue regeneration and improved performance while doing high intensity exercises. Glutamine is used by cells of the immune system, in particular lymphocytes, providing them with energy and optimal conditions for normal proliferation. Unlike muscle cells, immune cells do not have an enzyme catalysing the synthesis of glutamine from ammonia and glutamate, and therefore are unable to produce glutamine. As a consequence, satisfying their metabolic requirements depends on the synthesis of glutamine in skeletal muscle and its release into the blood or its delivery via food sources, including dietary supplements. Long-term intense training is associated with a decrease in the concentration of glutamine in the body, both inside the muscles and in the plasma. Therefore, it was assumed that a decrease in glutamine availability may weaken the immunological function and be responsible for the immunosuppression observed among athletes or people who frequently practice recreational forms of physical activity. Of the various tissues using glutamine, the intestines consume about 30% of its amount, indicating that it is the key nutrient for them. Glutamine affects a number of signaling pathways that regulate the cell cycle and proliferation of enterocytes, and thus maintains the integrity of the intestinal tissue. In addition, by participating in the synthesis of glutathione, it inhibits proinflammatory signaling pathways and protects intestinal cells against apoptosis and stress in both normal and pathological conditions. Taurine taken as a part of the pre-workout supplementation can have a positive effect on reducing fatigue and improving performance while doing endurance sports. The preparation is also enriched with vitamin B6 in the form of pyridoxine hydrochloride, which contributes to the maintenance of proper protein and glycogen metabolism and supports the proper homocysteine metabolism. In conclusion, Trec L-Glutamine T6 is a dietary supplement that can be a useful addition in both sports supplementation and all recreational exercisers. The product is a potential remedy for impaired immunity caused by physical effort, and thus can contribute to the continuity of training cycles and allow better conditions for adaptation. I portion (4 capsules) in the morning after waking up, II portion immediately after training, III portion before sleep. I portion (4 capsules) in the morning after waking up, II portion between meals, III portion before sleep. The daily requirement for glutamine for a healthy physically active person is about 0.1g per kg of the body weight. In the case of professional athletes, this number may even double. The recommended daily dose of glutamine will depend on the weight and training intensity of the person taking the supplement. The best time to take glutamine is in the morning on an empty stomach, right after the training or before going to bed.